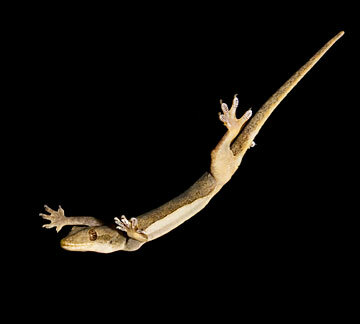 After watching the above video, you may be astounded by the way the gecko lands on it feet much like a cat does. Many animals have self-correcting mechanisms for falls, but most work differently and it takes research to figure out the different ways for different species. Cats do it by twisting their body to create angular momentum and adjust accordingly. Researches have recently figured out that a gecko corrects its fall. 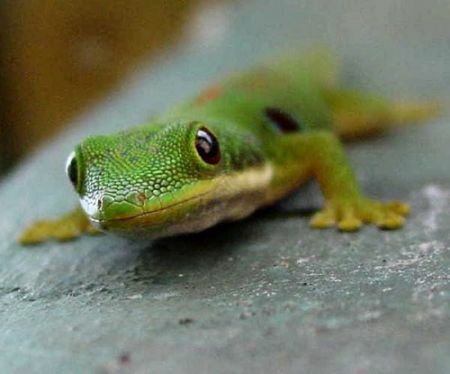 Ardian Jusufi, Robert Full and colleagues at the University of California, Berkeley have researched and created a robot simulation of the gecko’s correcting mechanism, called “RightingBot”. they used this bot to test their hypothesis that Geckos correct their fall with a flick of their tail, but they uncovered more than they initially thought. The gecko’s active tail gives it a huge evolutionary advantage. An active tail is a tail that the organism has control over, unlike a static tail which just sways with the motion of the organism. The static tail can be an ecumberence, but an active tail is an invaluable tool. Due to the nature of their environment, a gecko may easily fall a relatively high distance. Whether they are escaping a predator or simply made a wrong step, they need a way to land on their feet. Geckos accomplish this by flicking their tails and spinning their bodies around their tail in mid air. The “RightingBot” reflected this hypothesis as true, as it was made in only two parts, a body and a tail and was given the same inertial properties as a gecko. The gecko glides through the air! It does this by orienting its body into a static position where the equilibrium will move it forward. This is called an equilibrium glide. Upon further investigation, they observed the gecko flinging its tail back and forth to steer itself. The gecko’s tail gives it numerous advantages when falling from a tree, it allows it to land on its feet and control where it lands. If it needs extra movement on the x axis, normal to gravity’s pull, it can even use its tail and arms to “swim” through the air!